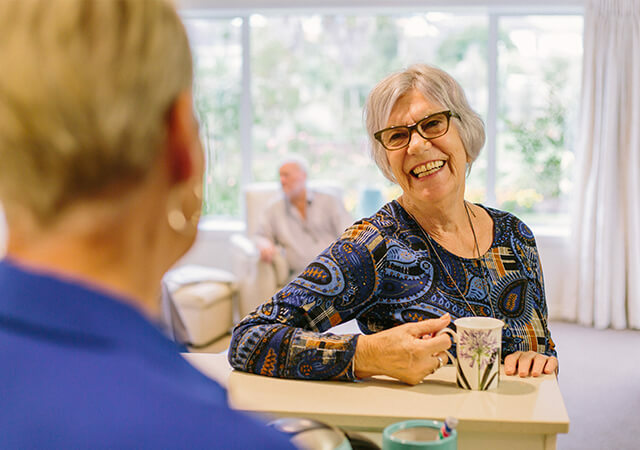 There are many facets that make the Ryman model work – our fair terms, care options that suit resident needs and resident-focused innovations. Most of all, our drive is to put residents first. It’s a simple formula, but it’s been a winning one for over 30 years. It is through this that we are able to offer some of the most resident-friendly terms in Australia. Our Ryman Peace of Mind Guarantees include a fixed weekly fee and a deferred management fee that is one of the lowest in the retirement sector, capped at 20 percent. It is the transparency that our terms and conditions are set out with that makes the real difference – protecting residents and their families to ensure that retirement is a chapter in their lives to savour and enjoy. We find that when our residents feel happy and secure, it creates a roll-on effect to the circle of family and friends surrounding them. There is great reassurance in knowing that a loved one will be looked after now and into their future. So that if their health needs change, we can continue to look after them. We offer independent and assisted living, through to the very best of low care, high care and specialist dementia care. There is no substitute for this peace of mind, and it is the reason why our villages are built to provide retirement living and care options within one village community. At the heart of Ryman villages are vibrant communities. Much like the neighbourhoods that residents grew up in, where neighbours had time to stop for a chat, cared for each other, and waved a friendly hello in passing. Our resident-focused innovations are about going the extra mile. We’re always looking at ways to improve the resident experience. Because we put the needs of our residents first, everything else falls into place. We’ve invested in innovations from Delicious menus offering choice and freshness, to our myRyman electronic care program enabling individualised care at the touch of a button. Plus, we have emergency power generators at every Ryman village, which inludes our serviced apartments, care centres and village centres. Keeping residents and staff safe and comfortable without interruption. Ultimately, our resident experience defines our success and it is why we will continue to put residents first. Because at Ryman, it’s all about people and that’s what makes the real difference.